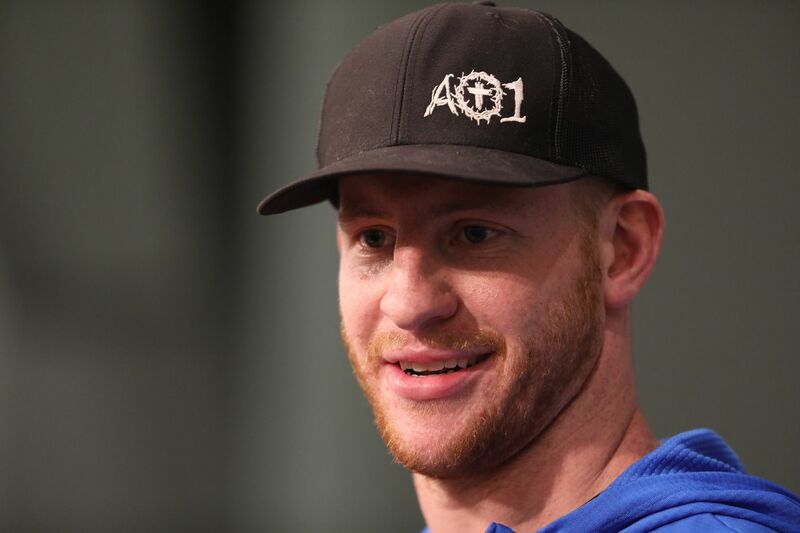 Carson Wentz spoke with the media about his return. Carson Wentz won't be a panacea for the Eagles and their offense. Injuries have mounted and affected chemistry and it won't likely matter who's under center with key figures missing. But Wentz's return will inject the struggling unit with some energy. Nick Foles and Wentz have more differences than similarities. There are areas in which the former has the edge, but for the most part, the latter has a better skill set. The following isn't meant as a knock on Foles, but rather to detail the ways in which Wentz can help improve the offense. How quickly can the Eagles’ Carson Wentz look like his old self? There will be rust and Wentz must curb his aggressive instincts as he returns from knee surgery. But it may not take much time before he's back to his pre-surgery self. Eagles coach Doug Pederson: I think just watching him move around physically and some of the things he's done; he's ready. He's ready to take the reins again and move forward. In Sunday's 27-21 loss to the Buccaneers, Foles' lone turnover came in the first half. Tampa zone blitzed and linebacker Kwon Alexander had a free rush. It's difficult to fault Foles, although a pre-snap adjustment could have slid protection. He did have receiver Nelson Agholor over the middle where Alexander had vacated. But he turned to his right, hitched and was hit just before he threw. Foles: I thought their defense did a really good job of mixing things up, keeping us on our heels, showing us different things. At the end of the day you're not always going to go to your first guy, you got to through your progressions. Foles, especially early on, had to go through his first and second reads. At times, the inability of the Eagles' outside receivers to get open was a liability, but most of the plays were designed to go inside to Agholor and tight end Zach Ertz. On this play, Pederson had Foles drop with an extra offensive lineman (Isaac Seumalo). The Bucs overloaded their four-man rush to one side, dropped into a zone, and Foles was sacked. Foles: Sometimes they were moving after the snap and I thought they did a good job mixing up their coverages. Every defense will switch their rushes and coverages, but it's on the quarterback — based largely upon film study — to anticipate post-snap changes. Wentz could be heard barking out that command many times during his first two seasons, but last year, his ability to audible led to many successful plays. On this play, Wentz appeared to change the play pre-snap. It's unclear if it was a dummy call to get the Redskins to change their defense (which they appeared to do), but the end result was the coverage he wanted — a zone that allowed him to slip a touchdown pass to Agholor. Most of Wentz's pre-snap options are simply run or pass. Pederson: We don't give him a ton of checks. But he should be even more advanced in reading defenses after spending so much of his rehab period in the film room this offseason. Eagles offensive coordinator Mike Groh: I think every year there's a comfort level, and then obviously being surrounded by the same guys and having a comfort level for what they do really well, and their comfort in the offense and being able to take something in an instant and make it happen out there during the course of the game certainly gives a lot of people confidence. I certainly do feel like that's a strength of Carson's. Foles was getting pummeled in the first half of the Bucs game. Some of that had to do with the rest of the offense, but he shared the load, particularly in blitz pickup. Tampa blitzed on only seven of 52 drops, but Pederson dialed up max, or near-max, protection on several plays. Anticipating a blitz, the Eagles kept seven in to block, but the Bucs rushed only four. There aren't many quarterbacks who are going to find an open receiver in that scenario. Should Foles had known to get out of that play based upon his pre-snap read? Maybe. But max protection wasn't something Pederson felt the need to do much last season. Will he have to now with Wentz coming back from injury? Pederson: I'm not going to coach scared. I'm not going to coach paranoid. I'm not going to go in thinking, 'Oh no, we can't do this, we can't do that.' We just have to continue to go play and I [have] to coach that way. … If there's opportunities to max the protection and do some things there, we'll do that by game plans, by design. The Eagles got it right on this play, keeping seven in to block seven. But with single-high, it's up to the receivers to get open vs. man coverage, and Shelton Gibson couldn't here against one of the Bucs' reserve cornerbacks. The Eagles are down their top two outside receivers with Alshon Jeffery (shoulder) still out and Mike Wallace (broken fibula) placed on injured reserve Wednesday. On Sunday, that left Agholor, Gibson and Kamar Aiken as the only healthy receivers on the roster. Aiken played 62 of 79 snaps and had five catches for 39 yards and Gibson played 35 and had zero catches. They did little to help Foles, even on high-percentage routes like this run-pass option slant by Aiken. To be fair, few of the designed pass plays had the outside receivers as the first progressive read, but on coverage reads-based plays, they had trouble creating space. The Eagles looked for outside replacements, but they ultimately signed a slot receiver — Jordan Matthews — on Wednesday. His insertion will likely mean more of Agholor on the outside. He was already lining up more outside than he did last year — a 55-45 slot-outside ratio on pass plays vs. 86-14 in 2017. But he's been more effective in the slot (10 catches for 78 yards and a touchdown) than outside (10 catches for 43 yards). On this play, he got matched up vs. a safety inside and gained 50 yards on a crosser. Agholor: I'm a wide receiver. I just want to play wherever they're going to put me to have advantage. But it's easier to create mismatches inside. Agholor: For sure, but defenses are going to do what they have to do. If I go inside and they put their corner and he follows me, then that's what it is. When I'm outside it's a corner. Agholor's career took off when he was moved inside following the Matthews trade last year. But he's a different player than he was in his first two seasons and seemingly in better state of mind. He's always had the speed for the outside and to the take the top off a defense. Agholor: I think I can run. I think it's on tape that I can run. 100 percent believe I can run and take the top off. Ertz leads the Eagles with 16 catches for 142 yards, but he's without a touchdown. He had two opportunities to score against the Bucs, but Foles missed him high here on this post route into the end zone. Foles: I wish the one to Zach in the red zone was six inches shorter. And Foles missed Ertz on this corner route on fourth and 10. Ertz: There was a flat defender. I don't know if that spooked Nick or what. Ertz caught 74 passes for 824 yards and eight touchdowns last season. He played only 14 games and still led the Eagles in receptions by 12. He should benefit from the return of Wentz. The quarterback often knew how to throw Ertz open, and if he wasn't "open" — like on this play — where to throw so his tight end could get it. Foles had some nice throws against the Bucs. His best came on this touchdown pass to Agholor. Foles has been a more accurate passer with the Eagles than Wentz, but he doesn't throw down the field as much. Wentz was second in the NFL last season in average pass length (9.91 yards) and average completion length (7.79). Foles' sample was small this season, but his averages were 7.32 and 4.15 yards. Wentz has a stronger arm and isn't afraid to use it. Pederson said last month that the velocity on his throws was higher this offseason. Wentz said he felt great physically, but was reluctant to say that his arm was stronger. Here's a bullet to Agholor last season. It may take the receivers some time to get adjusted to a different thrower. Agholor: They both throw different types of balls, but they're both very accurate and they give you chances. Many of Wentz's best moments last season came when he either extended plays in the pocket or down the field with his legs. Of the top plays as voted on by his teammates, many were jaw-dropping. The Eagles don't necessarily need Wentz to be that guy. Pederson: He's cleared and there's no need to hold back. Now, we're still going to have conversations. It's no different [than] when he was healthy. We're still going to have conversations about protecting yourself as we do with all the quarterbacks and making sure we do the right things there, but there [are] no limitations. But the Eagles could benefit from his natural feel and movement in the pocket. Foles is underrated in regards to his ability to throw on the move. But Wentz is in another category, as evidence by this play. Will Wentz have the same kind of mobility? We all will in four days. Eagles re-sign DT Tim Jernigan. Does that mean they’re going to draft Jeffery Simmons in first round?